It's amazing how many different ways George Mason has won games this season. They have not had a secret recipe they use for each match up. It might be smothering defense, it might be lights out three-point shooting, it might be fast break points off turnovers you just don't know. Yesterday afternoon's 66-51 victory over Georgia State added another method of winning for the Patriots, dominating at the free-throw line. I've been complaining about this team's free-throw shooting for some time, most notably last season, so a game like this really makes me happy. The statsheet chart at the bottom of this post really drives home how effectively Mason got to the free-throw line and made the Panthers pay. Towards the end of this game the difference in points at the free-throw was what was keeping them ahead. Getting to the line and playing solid defense is an easy way to win a basketball game and Mason proved they don't have to shoot 50% from the field or drain 10 three-pointers in order to win games. The Patriots are now 7-1 when their opponents turn over the ball more than 15 times in a game, Georgia State had 19 in this one. 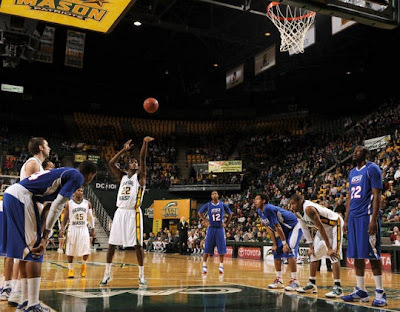 It was an important win for Mason because they face a very good Drexel team at home this Wednesday and then travel to Harrisonburg to face JMU who are currently 5-1 in CAA play. Glad to see Morrison changin up his free throw stance. Hopefully Williams getting more minutes helps motivate his offense. I was most impressed by Tate though. He gave us that shot in the arm that we desperately needed in the first half. Oh, and for the record, that tech on Pearson was total BS!